Mix all spices and dried herbs together. Coat the shrimp ( with their skins on) with Cajun rub, drizzle with 2 Tbl of organic sunflower oil. Cover and let marinate in the refrigerator for 30 minutes or more. Place shrimp on the BBQ grates, or in a BBQ tray. Cook for 2 minutes a side. Shrimp will turn pinkish white when done. They dont take very long to cook at all. Its great to cook them in their shell it keeps them moist. Peel the skin back by holding the tail. There’s a little bit of meat in the tail so carefully slide the shrimp out. The shrimp are ready to eat as is, over rice, on a salad, in stir fry, or as an appetizer. Super quick, oh so tasty, and easy for any meal! 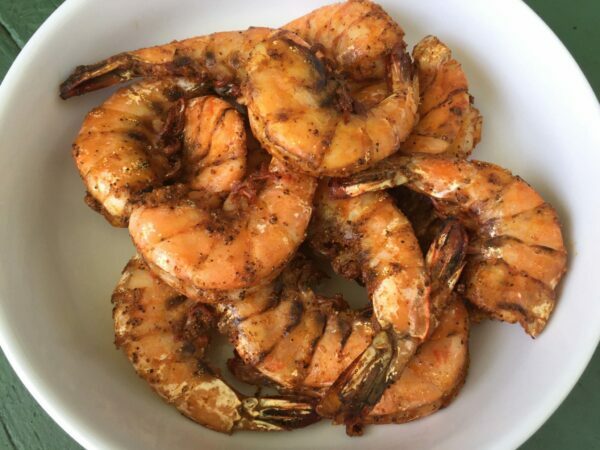 Place shrimp on the BBQ grates, or in a BBQ tray. Cooked for exactly 2 minutes a side. Topped shrimp with lemon wedges and serve. Great served as an appetizer, on skewers, over rice, noodles or stir fry, or topped on a salad.